A stunning statue created by our apprentices in tribute to Lancashire artist LS Lowry is set to become a seaside visitor attraction when it is officially unveiled on Friday. 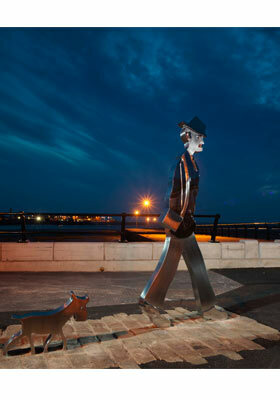 The work celebrates Lowry's famously painted matchstick man and his dog, included in several of his works, and will be located at Knott End on the Lancashire coast. It will be unveiled to visitors for the first time at a ceremony on Friday September 11 at 2pm which has been organised by Preesall Town Council in association with Wyre Borough Council. The statue will sit on the town's ferry slip site where the artist created some of his acclaimed work during summer stays at the seaside village. 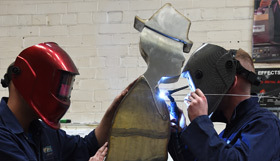 Apprentices at our award-winning training academy in Darwen have created the statue, which has been designed in stainless steel and will stand more than 5ft tall on the ferry slip site. The project has been overseen by Tom Elliot, divisional manager at our m-tec arm, which specialises in architectural metalwork fabrication. It is the latest in a series of high-profile jobs m-tec has carried out, including a stunning stainless steel arch war memorial honouring those who served in the Great War, which was officially opened by Prince Harry in Folkestone last year. The £5,000 project has been funded by Preesall Town Council and Wyre Borough Council. The Mayor of Preesall Philip Orme and his deputy Gordon McCann visited our training academy to see the statue taking shape and we have worked closely on the project. The mayor said: "The design is fantastic and it is great that the project has been carried out by apprentices. "The idea is to get more people into the village and to give them something to look at. We're really looking forward to seeing the completed work." Tom Elliot, who is from the Wyre, said: "We hope a lot of local people will show up to the grand unveiling as it is a significant part of the area's history. "It's fantastic to be working on a 'local' project and to be creating a piece of work honouring a true Northern genius. WEC Group is a community centred organisation and accepts projects free of charge from local authorities every year. Recent work has seen the apprentices restore a historical weathervane for a local church after the original was damaged in a storm. They also manufactured the iconic Darwen Spitfire Memorial Sculpture that was donated to the town alongside m-tec. Kris Mercer, Training and Development Manager, said: "The Lowry statue has been a really interesting and rewarding project for the apprentices. "It has helped them put many of the skills they are learning here into practice to produce some really high quality metalwork." LS Lowry is said to have often stayed in the boarding houses on the front in Knott End and used the ferry slip in several of his paintings famously known as 'The Ferry Slip at Knott End' and 'The Lunevale'.